Semantic search is the revolutionizing new concept that has opened an all new plethora of possibilities for enterprise search. Today, enterprises no longer have to be dependent on the traditional keyword based search tools for their complex search needs. The new age enterprise search tools like 3RDi Search, a product of The Digital Group, available in the market today are powered by semantic search and are designed to cater to not just search but also the entire bouquet of text mining needs of enterprises. The biggest challenge that enterprises face today when it comes to enterprise search, is the large volumes of data that is ever expanding. Interestingly, a lion’s share of this data consists of unstructured data which cannot be analyzed using the traditional keyword based search approach. Needless to say, enterprises today need an approach that can easily tackle unstructured data – accumulated from various sources – to derive useful insights from it that can be used to formulate business decisions. A semantic search tool is the answer to this, as it helps the enterprise manage and derive key insights from the unstructured data. Highly accurate and highly relevant search results. Operates much faster than a traditional search tool. Uses concepts like artificial intelligence (AI) and natural language processing (NLP) to understand the user’s intent behind the query. Works seamlessly with even the most complex unstructured data. Semantic search is what your business needs in order to gain deep insights from unstructured data, which can be used in decision making to make your business gain the competitive edge. So, how do you bring the power of semantic search to benefit your business? As we have mentioned earlier, the new age enterprise search tools are the answer. All you need to do is analyze your search requirements and choose a tool accordingly that will have the features to benefit your business. What’s more, many of these tools, including 3RDi Search, are power packed with features to cater to the needs of every enterprise and offer every text analysis feature you could ask for. With the many benefits it has to offer, semantic search has intrigued businesses across the globe. The rapid advancements in the field of semantic search indicate that the future holds unlimited possibilities. 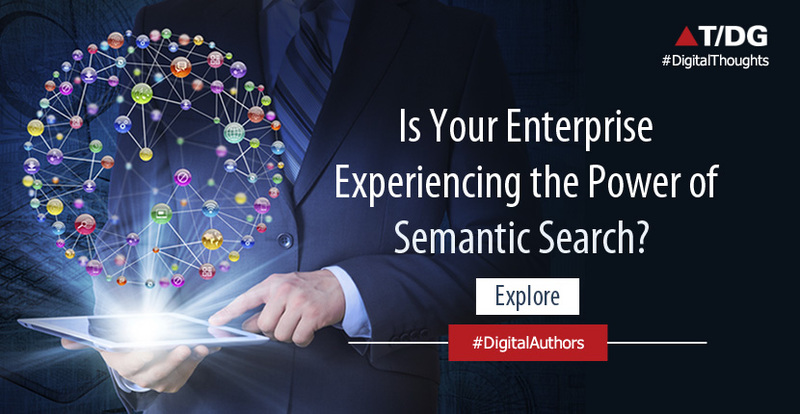 Has your enterprise switched to the semantic way of search? Drop us a line about your experience in the comment box below.